Taurus Hill Observatory | Taurus Hill Observatory introduced in EPSC, Madrid, Spain. Posted September 6th, 2012 by Harri Haukka & filed under Venus Transit 2012. The research work of the Taurus Hill Observatory will be presented in this year EPSC (European Planetary Science Congress) held in Madrid, Spain, 23.-28.9. 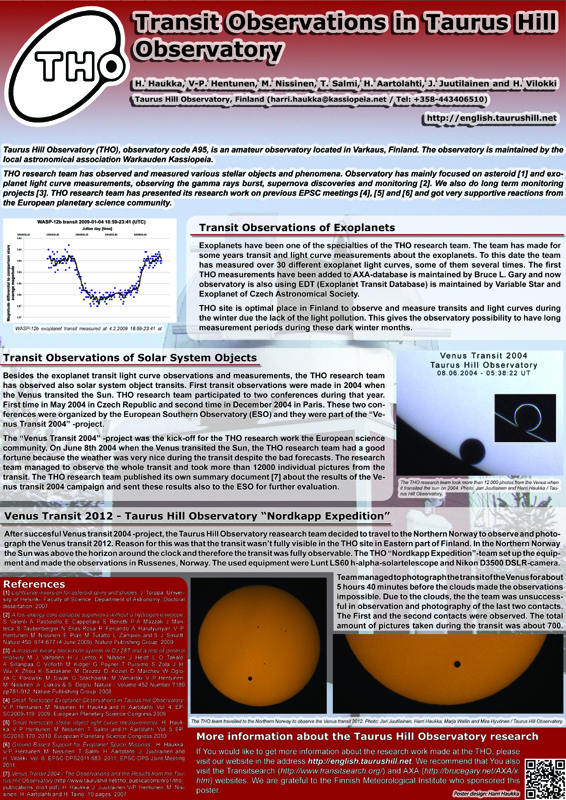 This years poster title is “Transit Observations in Taurus Hill Observatory” and it is focused on Venus transit observations 2004 and 2012. There is also one chapter about the exoplanet observations. Poster will be on view in IFEMA Fair Center in Madrid from Wednesday 26.9. to Friday 28.9. The attendance time of the poster is Thursday 27.9 18:15–19:45 when Harri Haukka will present the poster for the public. If you are in EPSC, welcome to see and hear about THO research work.